Making the Midwest roads accessible in a whole new way with quality and ethical import auto repair service and classic Volkswagen camper van RV rentals. Quality and trustworthy import repair shops are difficult to come by in St. Paul and Minneapolis. A breakdown, problem, or even maintenance work on a vehicle is never enjoyable or convenient. Even more troubling and irritating is wondering if your auto mechanic is taking advantage of your bummer situation. 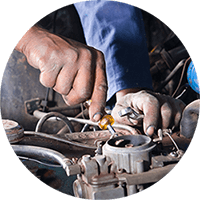 Locating an auto repair shop that is ethical, skilled and certified at their craft, and staff that are personable, honest, and caring is like a shot in the dark, but VanGo Auto is the lucky find to this important search. Our mechanics have deep knowledge and experience repairing Audi, BMW, Mercedes, Subaru, Volkswagen, and many other European and foreign cars. Allow VanGo to take care of you and get you confidently cruising on the road. VanGo Auto offers a blast from the past for one happy camper after another with our Volkswagen Vanagon RV rentals; a retro-glamping adventure sitting behind the wheel of a classic ride. 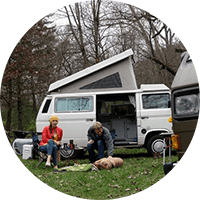 All over the country, the demand is skyrocket high for the retro-glamping RV rental experience of a Volkswagen Camper; although, the Midwest was the only region lacking this old-school-cool-as-heck opportunity until VanGo Auto joined the rental scene. Just show up and go – VanGo outfits your camper with all the necessary sleep, camp, and kitchen gear. Cruise in an easy-to-drive RV with a refrigerator, stove top, sink, comfortable sleeping spaces, and just what you need to hang space. These VanGo campers surely are positive memory making machines.